In thinking about Charlotte Mason and unit studies, I’ve been considering my love of hands-on projects. And I have some insights I want to share. On the one hand, CM loved living learning — actual exploration and direct observation. She constantly encourages us to get our children outside in nature to see it first hand rather than read about it in a book. Her math instructions include the use of manipulatives to make the abstract concrete. So I feel confident that she would approve of doing science experiments to visually see scientific principles being played out. But what about making paper Civil War soldiers or a playdough volcano diorama? Are those types of projects part of what CM encouraged? I don’t think so. From what I’ve read, she’d call those unnecessary. And although we do them, I pretty much agree with her. It is not necessary to make the models to understand the concepts. 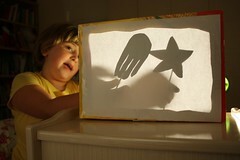 But for highly visual children, seeing a model can create an image that words from a book sometimes cannot. So I wouldn’t say that making dioramas is totally without value. But if a mom dislikes those kinds of crafts, she shouldn’t feel somehow that she’s an inferior teacher for not doing them. The learning can happen without them. This is the way I look at hands-on activities. There is hands-on learning, and there is themed play. I do see a distinct difference between the two. They both have their place, but one is deliberately academic and the other is not. then that activity is gets the academic okay. I call it hands-on learning. When an activity is forced and artificial, or when it does not contribute very much to learning, I call them themed play. Those activities, although often fun, are not really “school” in my mind. For example, putting together the paper model of the Hindenburg did not really add to Sprite’s understanding of hydrogen. That was themed play. 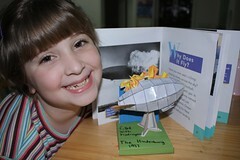 There was an actual connection between the Hindenburg and hydrogen, but assembling the papercraft didn’t teach her anything about history or science. 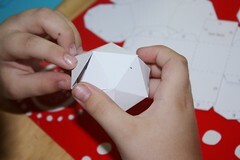 On the other hand, assembling the Platonic solids did teach her quite a bit. In fact, without handling the actual 3D objects, I hardly think I could say that she understood what the five shapes are. In that case, the activity was very much tied to the learning. So here I am admitting that we do non-academic activities. Why do we use themed play at all? Firstly, Sprite and I are fairly crafty people, so we truly enjoy themed play. If we didn’t do these things in conjunction with school, we would probably do them as pastimes anyway. Also, we don’t have a lot of activities such as church, scouts, homeschool co-op, and so on. So we have more time to fill. We choose to do arts and crafts with that time. Doing themed play does help to at least remind Sprite of our homeschool topics. Lastly, I mix up themed play with hands-on learning in our homeschool time to add variety and boost motivation. But I know that themed play is no substitute for real learning. There is a place for both, and as the teacher, I must be clear about the purpose for each activity. I could fill up our homeschool days with trivial hands-on projects that look impressive but don’t truly teach big concepts. Instead, I choose to sprinkle a few into our otherwise academically rich learning schedule. Because I can see the distinction between themed play and hands-on learning, it doesn’t bother me to skip projects that are scheduled in our Winter Promise curriculum. Sprite can always do those project on her own time for fun (as themed play). As long as she’s learning the concepts from the books we read, the other activities are not crucial. Thank you! That helps so much. I hadn’t really thought through the difference. I know I personally don’t like the hands-on stuff but I do seem to have one of those visual learners so I wondered how to incorporate some hands-on. I like the distinction you’ve made here, Jimmie. We don’t do much themed play (like the name too) – it’s not our scene, but I like how you use it and I see why. We tend to spend our time doing art, or doing crafts like knitting and embroidery – that’s Jemimah’s and my thing. .-= Jeanne´s last blog ..Don’t forget! =-. Good post – I hadn’t really thought of that, but it makes me want to evaluate our activities and see how we are doing in that area. Speaking of your Platonic Solids, I bookmarked that the other day, and have been wanting to ask you – how old is Sprite? She looks younger than my son but we haven’t gone anywhere near this in math yet. Are you naturally strong in math? Cause I’m not, (NOT!) and would love more living math recommendations from you – you seem to have a good thing going there! .-= Dana´s last blog ..apple trees and wriggly worms =-. I think this is a good assessment of the value of hands-on activities. I recently read this quote by Charlotte Mason in A Charlotte Mason Companion: “…children will dress up, act scenes; or they have a stage and their dolls or puppets act, while they paint the background scenery and speak the speeches. It is a mistake to think that a child will have much of an imagination just because he is a child. An imagination must be fed for it to grow, develop and become a strong, useful part of his intellect.” It seems that when real books are at the core, both hands-on learning and themed play have their place in a child’s education. .-= sarah in the woods´s last blog ..Thoughts on Thoughts =-. I really enjoyed reading this. It was helpful to me. Honestly, I had not thought much about the distinctions, but there are some and it’s good to pay attention to them. It’ll help me decide what to incorporate as a lesson, and how! .-= Lynn´s last blog ..Narration Through Drawing =-. Good thoughts! I think the distinction is good. Sometimes we may get carried away with themed play. I think this has me thinking that I should be careful that those things don’t take over our life. Thanks. .-= Rhonda´s last blog ..Kitchen Math =-. 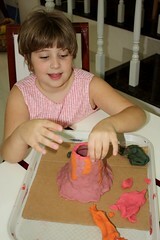 The volcano is a bit like a math manipulative – used to help illustrate the concept. If you can’t witness the real thing it’s a great way to visualise it isn’t it! Wonderful post!!! Thank you so much for sharing!! It put somethings in perspective for me!! Be Blessed! .-= Angie in GA´s last blog ..Giotto Inspired Art Lesson =-. .-= MasterpieceMom´s last blog ..A Reading Lesson =-. .-= Erna´s last blog ..Workbox Files Uploaded to Scribd =-. You’ve put it brilliantly! I love your emphasis on imagination and play. So true! Since my second is very visual I can see I’ll be visiting your collage a lot for more hands-on learning ideas.